Here are some dental issues you may face. 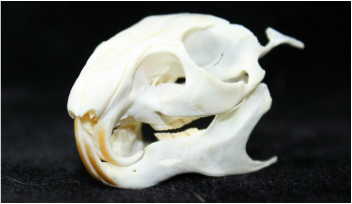 Chinchillas have 20 teeth, 4 front incisors and 16 back molars. 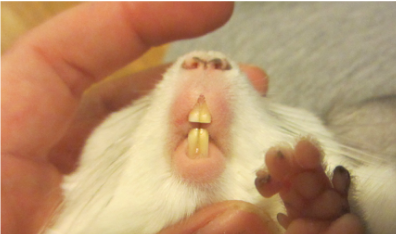 You can see the 2 bottom and 2 top incisors, but the rest of the teeth can only be seen by using a special tool called an mouth speculum ( the medical terms for these tools are Otoscope or a Lighted bivalve pediatric speculum ) most vet's have these tools to check for dental issues in chinchillas and other small rodents. Any issues with the alignment or growth with a Chinchilla's teeth or jaw line can be critical and life threatening. If you suspect your pet may have ANY dental issue, it's critical you get a vet's attention right away. 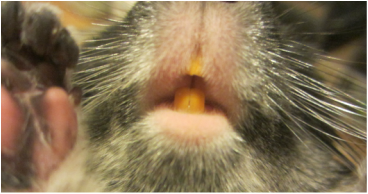 Healthy Chinchilla teeth are straight, ground down, and generally a deep yellow to bright red-orange. They are this color due to the enamel that contains Calcium, Iron, and Phosphorus. The more orange the better. 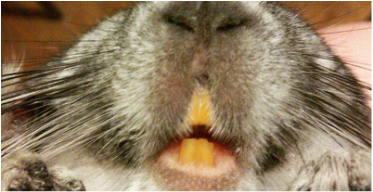 Teeth lacking this orange color means that the chinchilla is not getting enough of these minerals in their diet, or they have a calcium deficiency. If your pet has pale yellow or even white teeth, it can be a sign of future dental issues to come. However, it normally tends to be a lack of essential minerals in their diet. Switching to a quality pellet can help, also giving your pet alfalfa hay or cuttle bone will also give your chinchilla a boost in Calcium. Normally this can be treated at home, but if other issues present themselves please visit your vet for a thorough diagnosis. These teeth are pale yellow almost white, meaning this chin could use some extra calcium in his/her diet. Alfalfa and cuttle bone can help, but if there's no improvement a vet visit is in order. These teeth are a nice orange color, though they could be darker. The ideal range is orange to red-orange. Because chinchilla teeth are open rooted you can expect them to continuously grow a few inches a year. This growth is the reason it's so important for your pet to be fed a quality diet and ample amount of hay. Their diet is what will supply their teeth with the minerals they need, and the hay will provide roughage to keep the molars ground down at a healthy length. It's also important to supply wood sticks or chew blocks for your pet to chew. Not only does it keep their 4 front incisors trimmed, but it curbs their natural desire to chew. Malocclusion ( or Malo ) is one of the worst things to happen to a Chinchilla. It's a life threatening, and often fatal disease that affects the alignment and growth of teeth. In our opinion, Malo comes in few forms; Genetic, Traumatic, and Neglect. - The genetic form of Malo comes from poor breeding. Animals with dental issues should not be used for breeding, they often pass these issues on to their offspring ( animals with dental issues due to trauma are an exception ). Reputable breeders go out of their way to keep these animals with the genetic predisposition out of their herds. This is always fatal, as there is no cure. The only treatment available is to maintain until there is nothing left to do but euthanize your pet. - Traumatic Malo comes from removing, breaking, or damaging the teeth or jawbone. Any blunt force can cause the teeth to become misaligned, and grow erratically. The only treatment available is to maintain the teeth the best you can until there is nothing left to do but euthanize your pet. - Malo from neglect is when the animal is not fed a proper diet, causing the teeth to become weak and die or break. It is also from neglecting to provide ample hay or chew sources and allowing the teeth to become over grown. 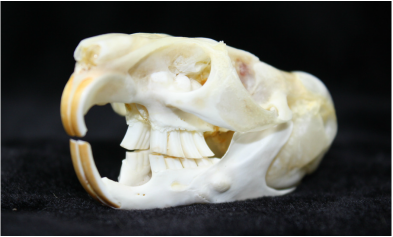 Once the teeth over grow and become misaligned there is a low chance in "curing" your pet. If caught soon enough and corrected your pet can live a healthy life. Changes would HAVE to be made to their diet and environment to promote healthy teeth. Common signs of dental issues are : Tooth grinding, Drooling, Wet or watery eyes, lack of appetite, rejection of chew toys, pawing at mouth, loss of fur around the chest & upper body, weight loss, and gagging sound while eating. Here you can see a chinchilla showing advanced signs of Malo. Weepy eyes, drooling, wet chin, nasal discharge, and loss of fur. It should NEVER get this bad, and unfortunately this chinchilla had to be put to sleep. RIP. 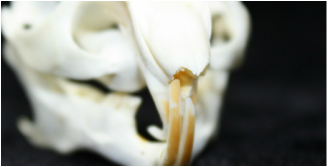 Common dental issues with chinchillas are tooth loss, tooth or root elongation, spurs, or worse Malocclusion. These are all dental issues that MUST be handled by your vet. Photo Credit: Let's Love Chinchillas. Edit : We never once claimed that Maleigha had or has Malo. This photo is our property, and we used it to show what drool under the chin looks like so owners can identify when there is an issue. Maleigha broke her leg in a unsafe cage and had to have it amputated. While she wore her cone, she drooled and had fluids ( such as meds and critical care ) drip down her chin mimicking the look of Malo. The footage below is of a Chinchilla whom went by the name of Doughnut. We had the privilege of having Doughnut in our home about a year before his health declined. We had bonded him to a rescue, and at that time he was healthy. Doughnut was purchased from a pet store, and unfortunately was diagnosed with Malo at the age of approx. 6 years old. His rear molar's roots were elongating, causing extreme discomfort while eating, and rapid weight loss. His owners did not know it was so serious, and once they were convinced he was ill they rushed him to my home. We had a discussion about malo, and they learned the hardest way about this horrible disease. This is not curable. His family had him put to sleep to ease his pain, and they were heartbroken after agreeing to make that decision. This is a very real possibility for those who breed indiscriminately or for those who purchase from backyard breeders. Tooth loss - Missing or Broken teeth. 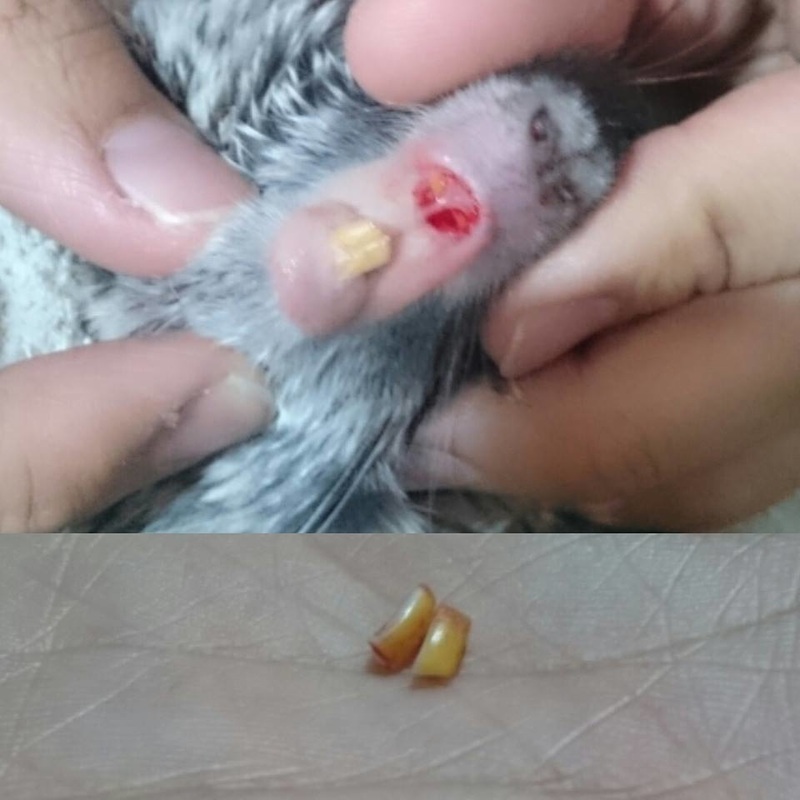 When a chinchilla looses a tooth, it can be the start of a deeper problem. In most cases a lost tooth comes from some sort of trauma to the jaw bone or teeth. This trauma could be falling and hitting the jaw or tooth. When a chinchilla breaks a tooth, it's important to have the tooth smoothed out to prevent any sharp edges from cutting the cheeks, lips, or tongue. Depending on the severity of the break, a vet may have to even the tooth out. A simple chip can be corrected by offering plenty of chew sources and hay. Your chinchilla's natural chewing will even it out. When a tooth is pulled or missing, it's important to have a Vet check for any damage to the jaw bone. When a tooth is removed, root and all, it will not grow back. This is a danger, because now the tooth opposite of it will not have anything to grind against, which means that tooth will become over grown and need to be constantly trimmed by a Vet. Not only will there be a overgrowth risk for the opposite tooth, but a missing tooth allows room for other teeth to move into the space, causing a misalignment of all the teeth. This is normally something that can not be corrected, and will become a form of environmental Malo. Here you can see Odin Chipped his lower Left ( right in photo ) incisor. This is very simple, and will be fixed in no time with ample hay and chewing sources along with a trip to the vet to check for any split in the tooth. 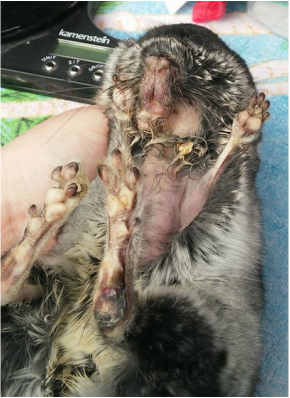 Here you can see Mephis broke her two top incisors, due to a fall in her cage. They needed to be removed, and monitored for healthy growth. She was lucky not to loose them! Photo Credit to Andrea Sim. Here is a photo of a tooth that has split in half and has decay. Tooth elongation can happen for a variety of reasons. Most often or not, it's genetic or from some sort of trauma to the mouth. This is when one or more teeth grow rapidly and become uneven. It makes it very difficult and painful for a chinchilla to chew and eat. It can also happen due to tooth loss and misalignment. You can not cure tooth elongation, only maintain it by having regular vet visits and trimming procedures done. 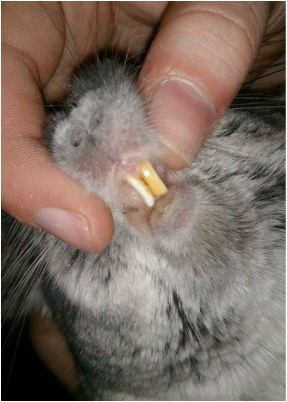 Photo provided by Kyle Lemler from Chinchillas by Design Here you can see over grown, and uneven teeth. Root elongation is exactly what it sounds like. The elongation of the tooth's roots. Unlike tooth elongation, root elongation can not be managed or maintained by vet intervention. The roots are "genetically wired" to grow excessively. Normally the roots will invade the nasal cavity or eye socket and cause discomfort and pain for the animal. The only way to rule out root elongation is to have dental x-rays done of your pet, and because this is incurable, root elongation is a fatal disease. The kindest thing a owner can do is help their pet cross the rainbow bridge before they suffer in pain. A tooth spur is formed when teeth are not aligned properly, causing the tooth to grow at an angle. This causes the teeth to be filed incorrectly, and sharp points form. These points will be painful and cause cuts inside the animal's mouth. When your pet is found to have dental spurs, more often or not they will continue have spurs form throughout their life. If caught soon, a vet can remove the spur and smooth out the tooth to prevent any discomfort or pain. Dental spurs require maintenance and check ups. If caught soon and maintained, a chinchilla can live a healthy life. Photo provided by Kyle Lemler, From Chinchillas by Design. Here you can see the back molars growing at an angle. They would be rubbing the cheek. The best advice I have to offer you about any preventative measures you can take is to be responsible. Don't breed animals that have no genetic history, these animals are 2x as likely to develop dental or other genetic issues. 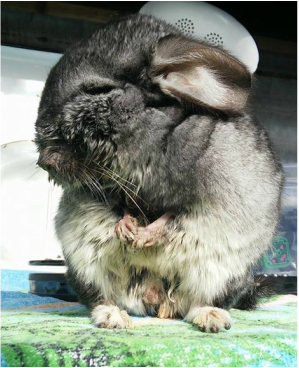 Look for a reputable breeder to buy your pet from, or if you choose to purchase from a Petstore or Chinchilla Rescue do your part to provide the best home environment. Always house your pet in a safe cage to avoid any traumatic falls, and remember to house your pet correctly. It's important to feed a quality diet that meets your pet's every need, as well as offer plenty of chew sources. Hay should also be a staple to provide adequate wear of the teeth. Have your vet give your pet a yearly check up, and if there are any signs of dental issues be proactive. Have your pet thoroughly checked in order to catch things early if they're present. Sometimes, no matter how well you love and care for your pet they can still develop Malo. It's most likely genetic. If you purchased your pet from a breeder it's always encouraged to respectfully notify them with proof from your vet that your animal did have Malo. A good breeder will offer their condolences, and thank you for bringing it to their attention. Then they will do what needs to be done for their herd to to help prevent this from happening in the future. Your pet will be placed under anesthesia to get a clear look at the molars with a speculum. Then while your pet is under anesthesia, x-rays will be taken to get a better look at the teeth alignment and roots. If your vet finds any forms of dental issues, and depending on what you agreed upon they will contact you or go straight to surgery. Surgery will only temporarily fix any dental issues. If teeth are overgrown, they will be clipped and filed. However the teeth will continue to grow, and will need monthly maintenance to be kept at a manageable length. Broken, or decayed teeth will be removed, but this creates space for other teeth to move and become misaligned which causes teeth to grow incorrectly. It will cause another problem. Tooth Spurs will be filed down, but your pet will need monthly checkups to check for other spurs and to have them filed. This degree of dental maintenance is incredibly heavy on a chinchilla's body. They will have to be put under anesthesia every time, and undergo a recovery period being hand fed for 1-4 weeks until the pain in their mouth leaves and they eat on their own. Chinchillas under this tend to loose weight and loose the desire to chew. When they lack proper nutrition it causes the teeth to become weak, as well as their body. As the chinchilla ages it will be harder and harder to bounce back after the operation. This maintenance leave no quality of life left. The most humane thing any loving owner can do is to have their pet euthanize if diagnosed with Malo. It's a very painful disease to live with, and very expensive to treat and the end result is still the same. It's best to end things before anyone begins to suffer. Sometimes loving a pet is knowing when to let them go.